B race yourselves, New Yorkers: Summer Streets is back. 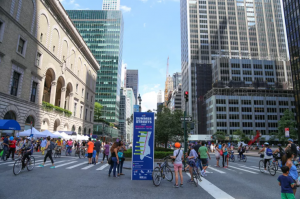 The Department of Transportation’s popular program, which turns Park Avenue into a car-free oasis for three consecutive Saturdays, will return August 4th, 11th, and 18th, from 7 a.m. to 1 p.m. This marks eleven years since Summer Streets launched, and the program has become more popular than ever, with nearly 300,000 people attending last year’s event. In celebration of the 11th iteration of the event, the city is going with the theme “finding joy in unexpected moments”—which manifest itself in activities like live music performances, walking tours, food stands, and more. “This year’s programming explores this theme by offering the public unique moments to experience the streets in new ways—to see, hear, taste, smell and feel at a heightened state as if for the first time,” DOT Commissioner Polly Trottenberg said in a press release. 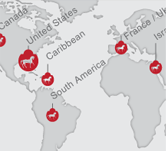 This year, activities will be spread out over five “rest stops” at various points along the nearly seven-mile route. 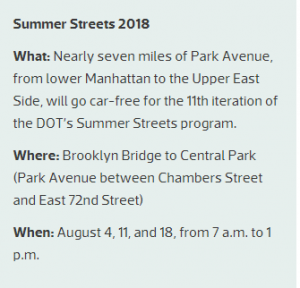 What: Nearly seven miles of Park Avenue, from lower Manhattan to the Upper East Side, will go car-free for the 11th iteration of the DOT’s Summer Streets program. When: August 4, 11, and 18, from 7 a.m. to 1 p.m. Among those are a Clif Kids Park experience at Astor Place, where children under 12 can ride through a “custom pump track that mimics what they would find in the many mountain bike trails in the area,” a food and beverage sampling zone; and the popular 165-foot-long, 30-foot-high zipline, which will be installed near Foley Square. Of course, shutting down one of the city’s biggest thoroughfares to cars does mean that there’ll be street closures and traffic changes aplenty. And it won’t just affect people driving in the city; it also means that buses will be re-routed, parking will be restricted, and traffic to and from the Brooklyn Bridge will be diverted.